Two-car Houston MetroRail light rail train glides northbound in reservation along Main St. Notice landscaping in median, where station platforms are also placed. Photo: Mike Harrington. While the so-called “People’s Republic of Austin” has agonized, dillied, dallied, and dawdled for years over whether or not to give priority to transit, or to preserve sacred traffic lanes for cars, Houston — long assumed to be a poster child of motor vehicle dependency — already took the plunge over a decade ago, carving dedicated transit reservations out of some of its busiest central-city arterials for its MetroRail light rail transit (LRT) line. 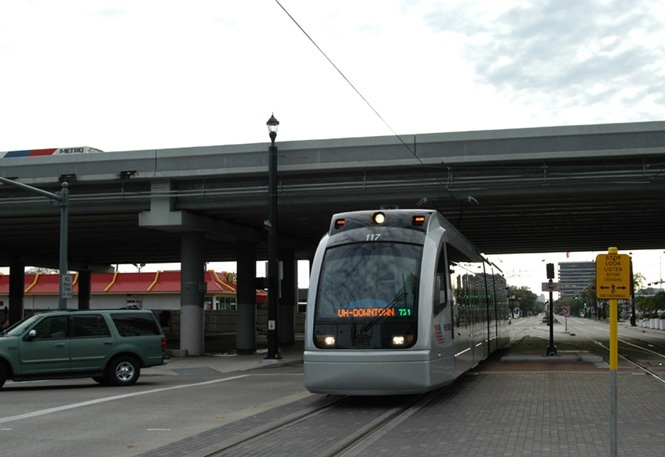 Opened in 2004, Houston’s MetroRail runs 7.5 miles with 16 stations through the heart of the city, from University of Houston–Downtown to Fannin South, using well-separated reservations created by re-allocating former traffic lanes and turning (“chicken”) lanes to rail transit. It’s highly successful, carrying 37,500 rider-trips per average weekday (second quarter 2013) at about 8% lower cost per passenger-mile than Houston’s bus system average (National Transit Database, 2011). 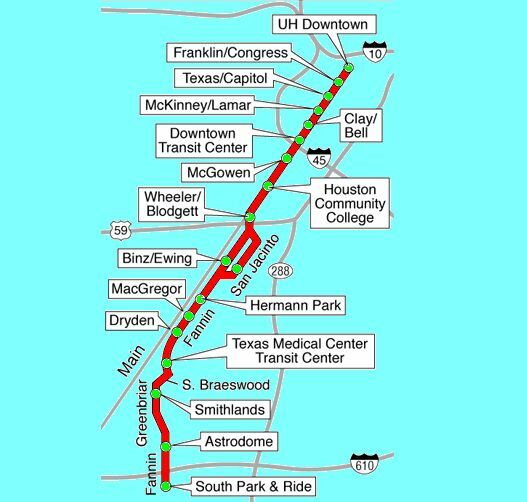 MetroRail is routed almost entirely on major arterials through central-city Houston. Map: Light Rail Now. 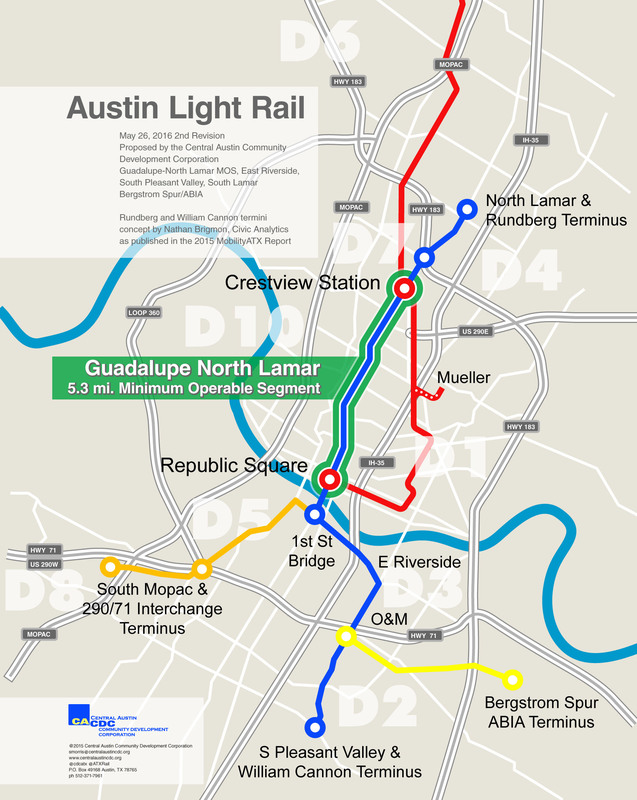 From the standpoint of the engineering design of its alignment, MetroRail presents a model of what could be possible in Austin’s Guadalupe-Lamar (G-L) corridor. 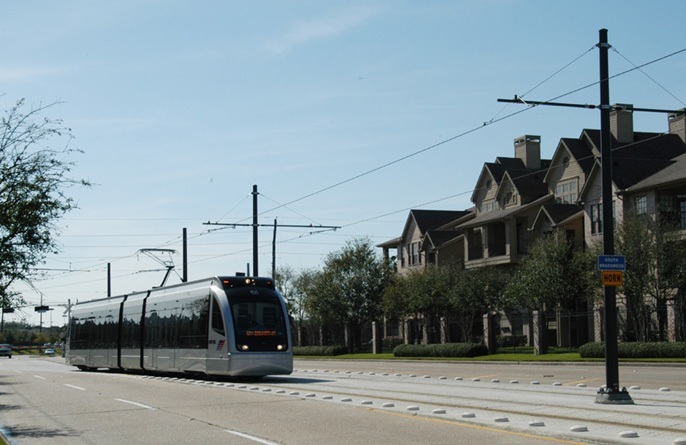 Facing the constrained street right-of-way available, Houston’s local decisionmakers and planners bit the bullet, opting to re-allocate entire street lanes away from motor vehicle traffic, and allot the space to the much higher carrying-capacity of the planned new LRT line. The most drastic re-allocation occurred on Main St., which in its most constrained section was originally a four-lane street with a center turning lane. 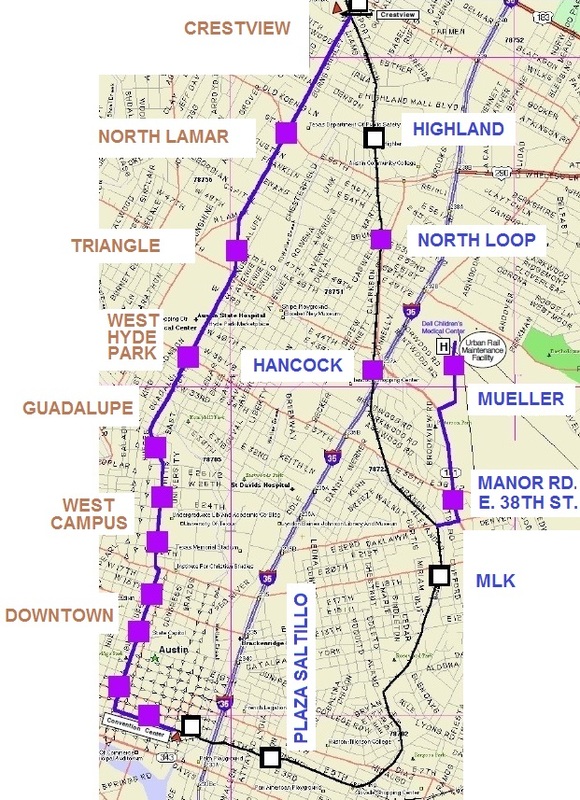 About 40% (northern section) of the route runs in Main; there’s a short section of several blocks with the line split between Fannin and San Jacinto Streets; then the remaining southern portion of the route runs in Fannin. 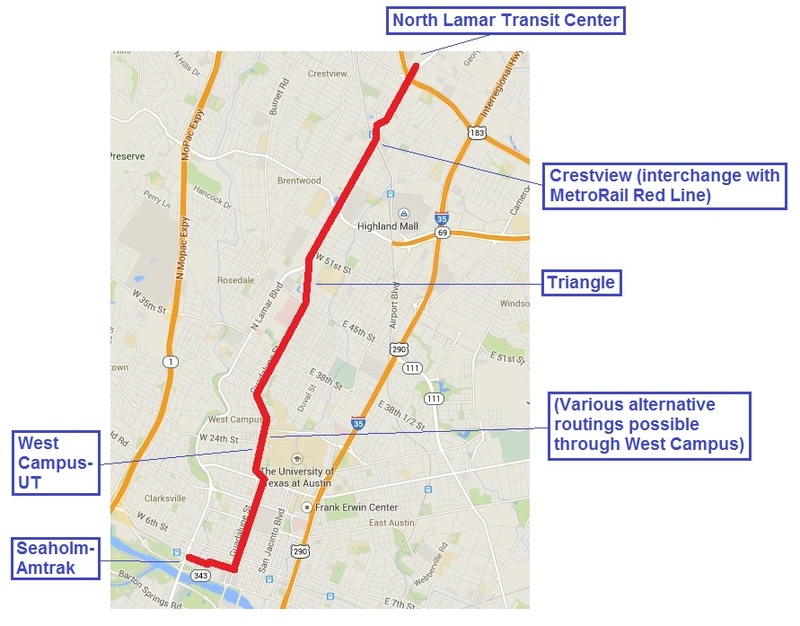 The remainder of this post is mostly a photo-essay on selected street alignment features of Houston’s MetroRail, particularly showing how previous traffic lanes have been re-allocated to transit in route sections most closely resembling the conditions of Guadalupe St. and Lamar Blvd. in Austin. Overhead view of MetroRail on Main St. at Preston. Photo: Houston Metro. 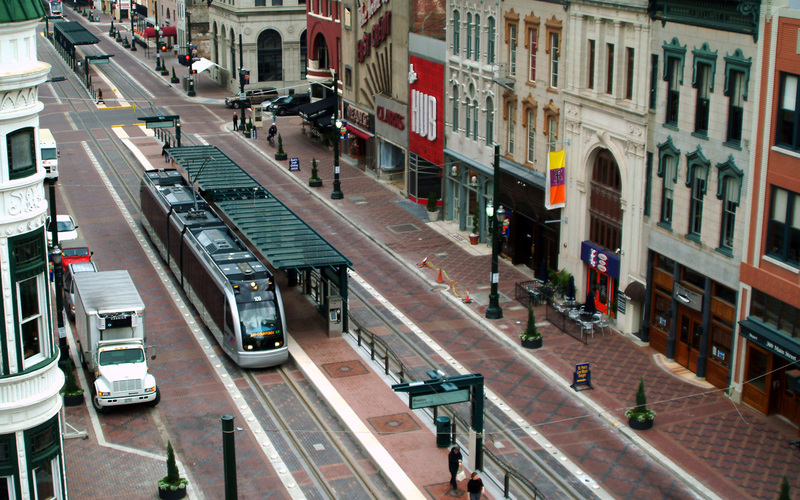 The MetroRail LRT system was installed in Main Street as part of a massive overhaul of Houston’s downtown streets beginning in the late 1990s. The objective was to emphasize pedestrian and transit access while reducing motor vehicle traffic. In the photo above, you can see how LRT tracks and stations — and widened sidewalks — have replaced what was once several traffic lanes. Traffic has been reduced to one lane in each direction, with occasional parking space, mainly so adjacent stores and offices can be accessed by commercial services. Main St. without MetroRail. Photo: Wikipedia. 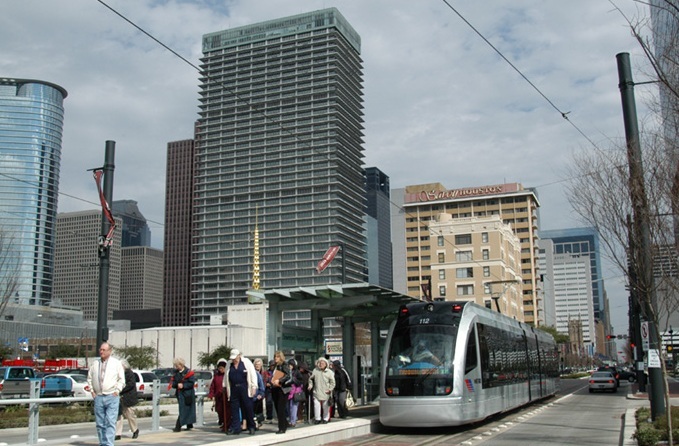 Further south from downtown, near the Medical Center, the MetroRail alignment leaves Main St., and continues in Fannin and San Jacinto Streets. However, Main continues south. In the photo above, Main St. is a bit wider than it is in the more constrained section downtown, but you can still get an idea of how the street looked before MetroRail. Main St., 2 views of MetroRail alignment. LEFT: Train near Preston (photo: L. Henry). RIGHT: Train near Gray (photo: Frank Hicks). 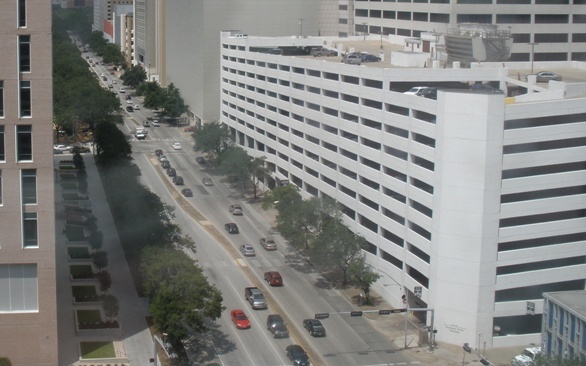 The two photos above illustrate the MetroRail alignment from ground level — the left photo in the heart of downtown, the right photo further south on the edge of downtown. Notice the use of large traffic buttons to emphasize segregation of LRT tracks. Also notice how the median area between tracks is used for both stations and landscaping. MetroRail passengers deboarding at Downtown Transit Center station. Photo: Peter Ehrlich. This view, showing passengers deboarding a MetroRail train at the Downtown Transit Center station, provides another ground-level view of a station fitted into the Main St. streetscape. MetroRail passing under I-45. Photo: Peter Ehrlich. Houston’s MetroRail passes under a couple of freeways as it heads south from downtown. No reconstruction of the grade separations was necessary — track and overhead contact system (OCS) wires were simply installed through the underpass. Here, a train on Main St. passes under the I-45 freeway not far from the Downtown Transit Center station. This may offer design hints for solving similar underpass LRT needs in Austin, such as the proposed extension of the Guadalupe-Lamar line under the US 183 underpass. Aerial view of MetroRail on Main St. at Ensemble-HCC station. Photo: Screen capture by L. Henry from Google Maps. This aerial view of the alignment in Main St. at the Ensemble-HCC station gives another perspective on how MetroRail has been fitted into the streetscape south of central downtown. Stations are staggered, with separate platforms and shelters to serve either northbound or southbound trains (thus not requiring extra street width). 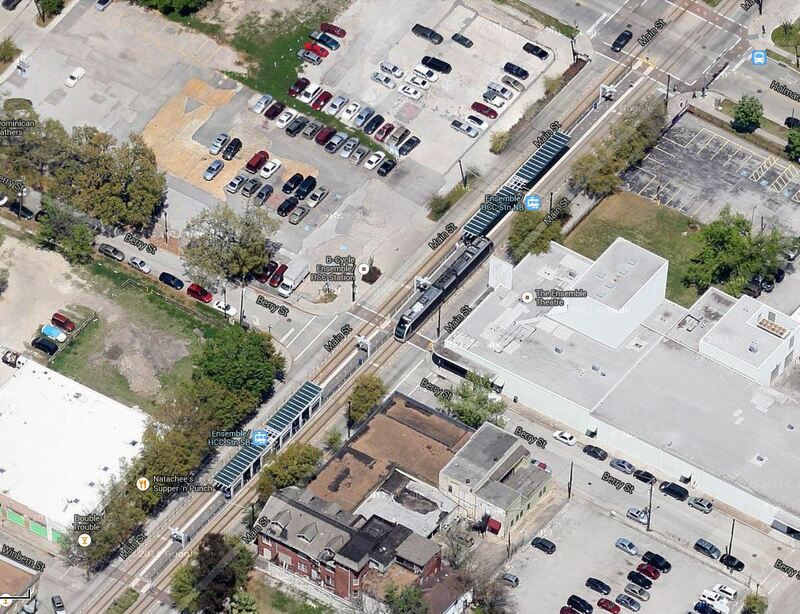 Map showing MetroRail transition from Main St to Fannin-San-Jacinto (Screen capture by L. Henry from Google Maps). 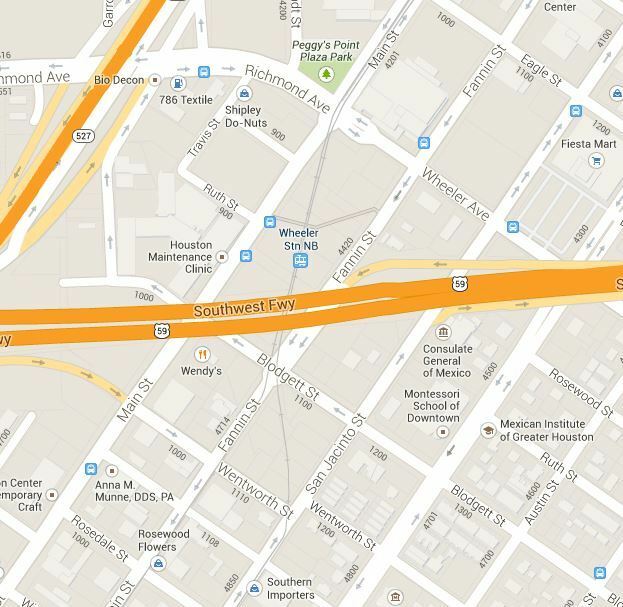 The map above shows where the double-track MetroRail alignment leaves Main St. (at Richmond and Wheeler Ave.), runs diagonally southward, and then splits (just after passing under the Southwest Freeway), with the southbound track following Fannin St. and the northbound track following San Jacinto St.
Aerial view of 2 tracks splitting into single tracks on Fannin and San Jacinto. Photo: Screen capture by L. Henry from Google Maps. In the aerial view above, the double-track MetroRail alignment can be seen running diagonally, passing beneath the Southwest Freeway, and then splitting into single tracks on Fannin St. and San Jacinto St., where the tracks are laid in curbside alignments. MetroRail Museum District station. Photo: Houston Metro. 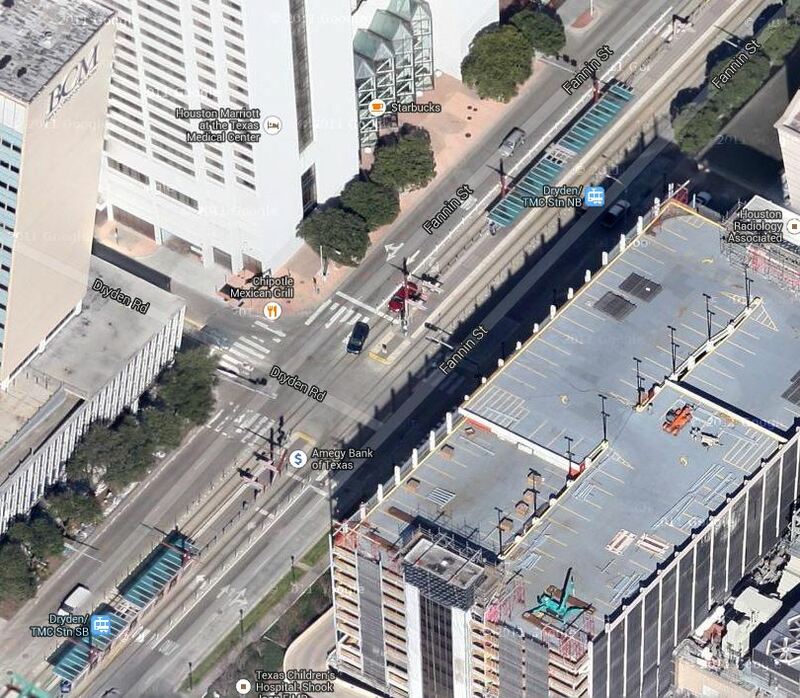 The photo above shows the curbside MetroRail alignment and a curbside platform at the Museum District station. Note how light rail station platform is raised approximately 14 inches above track level (which is also street level) to permit level boarding into each car. The woman will be able to roll her baby carriage directly onto the train, with no lifting or need for a ramp. Aerial photo of Fannin-San Jacinto single tracks merging into double-track on Fannin. Photo: Photo: Screen capture by L. Henry from Google Maps. 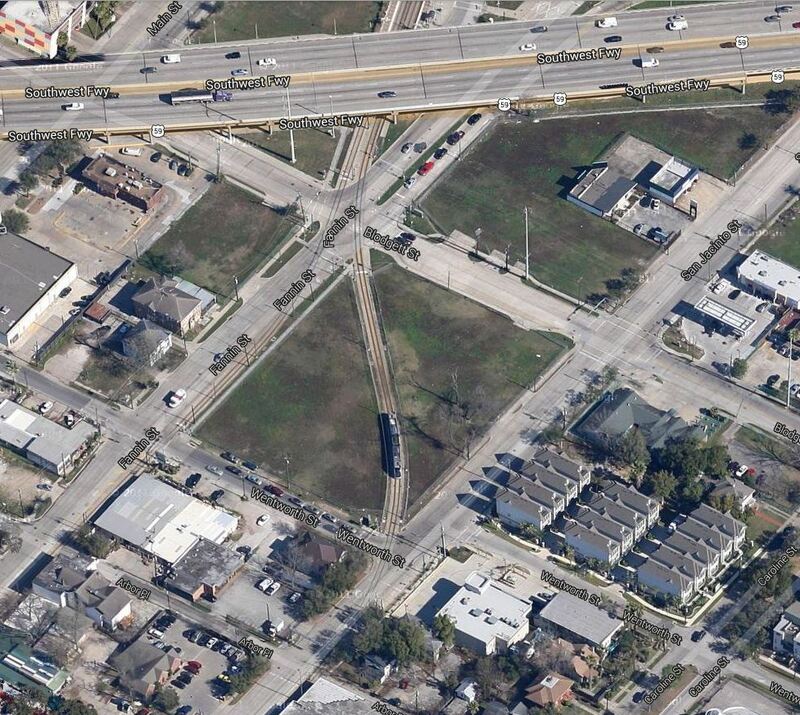 This aerial view shows how the single-track alignments on Fannin and San Jacinto are merged south of Hermann Drive into a double-track alignment on Fannin St.
MetroRail Hermann Park-Rice University station on Fannin St. Photo: Peter Ehrlich. 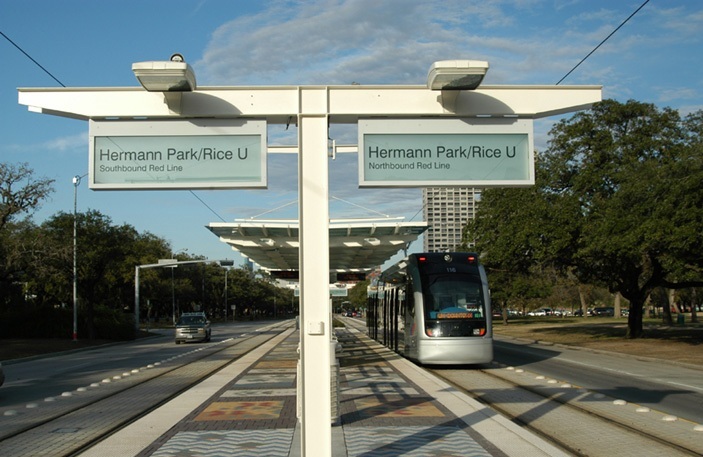 Somewhat further on south on Fannin St. is the Hermann Park-Rice University station. This cross-sectional view shows how the median island-type station, serving both directional tracks, is fitted into the roadway, with trackage separated by traffic buttons. 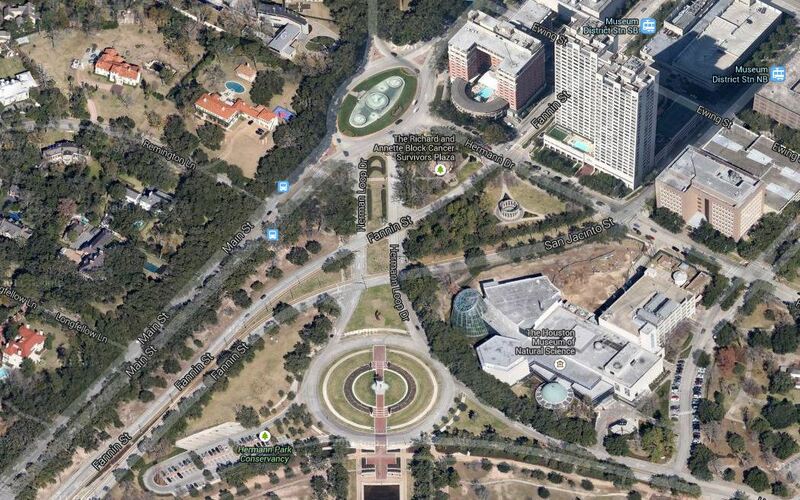 Aerial view of Hermann Park-Rice University station. Screen capture by L. Henry from Google Maps. 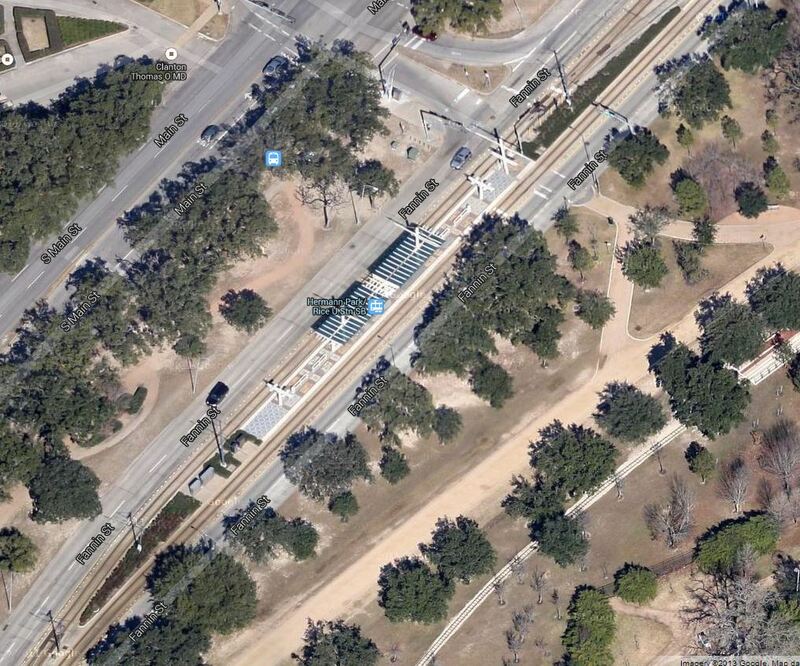 The photo above provides an aerial perspective of the Hermann Park-Rice University station. 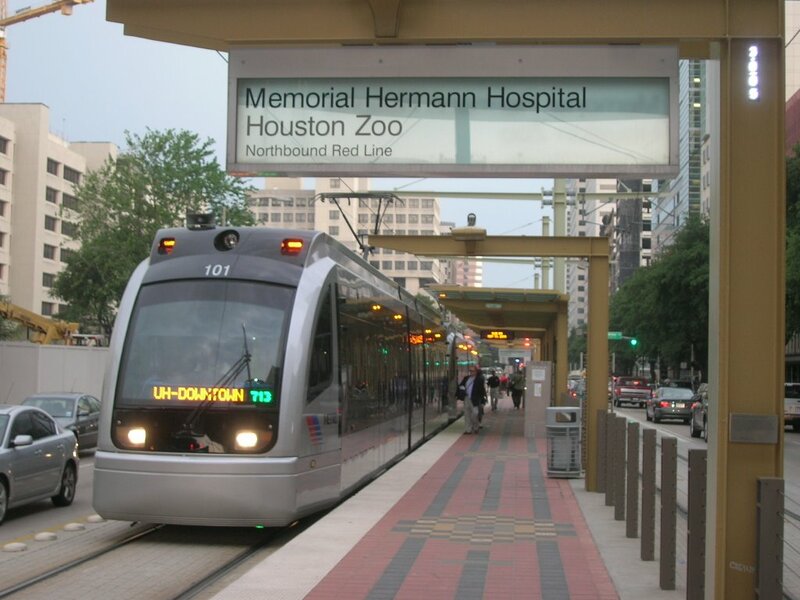 Train serving Memorial Hermann Hospital-Houston Zoo station. Photo: Panoramio.com. This ground-level photo of a train stopped at the Memorial Hermann Hospital-Houston Zoo station illustrates how (to accommodate the narrower roadway width) station design has reverted to the staggered-platform layout, with separate platforms and shelters for each direction . Passengers waiting to board train at Dryden/TMC station Photo: Brian Flint. 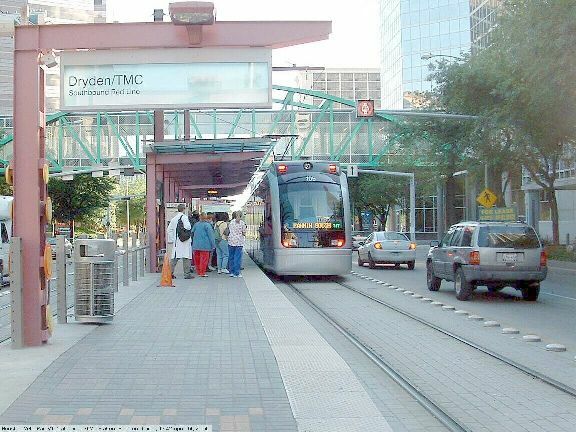 Because of the tight street constraint, the Dryden/TMC station has a staggered-platform profile similar to the Memorial Hermann Hospital-Houston Zoo station. Aerial view of Dryden/TMC station. Screen capture by L. Henry from Google Maps. This aerial view of the Dryden/TMC station illustrates how left turn lanes are handled. Notice that there are left-turn channelization arrows painted in the trackway. Cars are allowed access into these turning lanes (i.e., sharing the LRT tracks) via the traffic signal system. Notice cars in the upper right photo queued in the lane and preparing to turn left. MetroRail train on S. Braeswood Blvd. Photo: Peter Ehrlich. For a short “dogleg”, the MetroRail alignment departs from the Fannin route and runs in S. Braeswood Blvd. and Greenbriar Drive before returning to Fannin. This photo shows how the trackage is aligned in that section of the route. 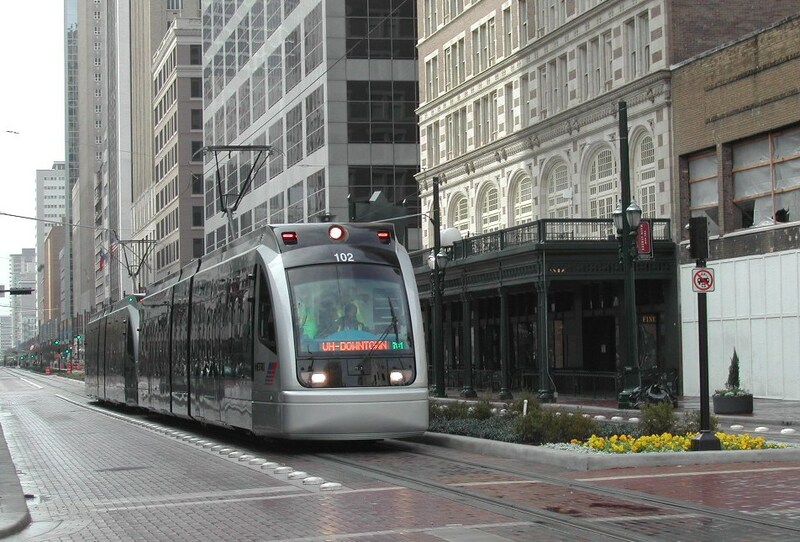 Certainly, Houston’s MetroRail doesn’t represent a design “blueprint” for Austin (or any other community) that can simply be replicated — every city has its own challenges and needs in terms of streetscape and transit requirements. 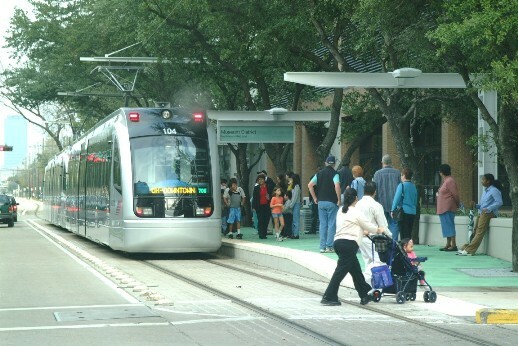 However, MetroRail does demonstrate an excellent Best Practices guide as to how this major auto-centric and asphalt-centric city has found the will and the way to incorporate workable, efficient, and attractive urban rail into a fairly constrained streetscape environment.